Boston here I come ready or not! I woke early today around 4 am and found myself check the Met Office aviation weather web site spot wind forecast, the prospect of my first solo cross country was playing on my mind. Before I went to bed I was rehearsing my radio calls, practicing when to say what! I managed to get few more hours sleep before it was time to get up, on waking the second time I checked and printed the spot winds again, drew out the triangles of velocity, filled out my PLog then had breakfast and took the dog out for a walk too, by the time I had done all of that it was time to leave for Chatteris airfield. On arriving Mike was busy explaining what’s involved in training for your NPPL(M) to a new person, I said I would check the plan out ready and as I walked out Mick called me back telling me that Stuart was out flying in it! Pat said he was off to Cromer and Mick and Julie were about to go flying too, I was waiting for Mike to finish talking to the new person to confirm if I was going solo to Boston or not. Stuart returned in GL a little before 12:00 and I went out and checked her over ready for my flight, still not sure at this stage if I would be going solo or not. I was looking forward to my first ever solo cross country, but also afraid of failing! What if I missed Boston Airfield and flew into the Coningsby MATZ just beyond? What in on my return I failed to spot Chatteris and over fly it while there are parachutists in the air?, and what if I got totally lost! On walking back into the clubhouse Mike confirmed it was looking good for my solo and suggested I called for Boston Airfield for permission to land (Boston is a PPR airfield). I call Chris the CFI at Boston who said it would be fine to come over and gave me the local weather and runway in use (27). Just before I set off Mike gave me a pre-flight briefing confirming how I would join and leave at each airfield, he also gave my headings a quick check too. It was now time to go, I performed the normal checks and then taxied out to runway 24 flew the circuit and at the end of the downwind I headed out to March. At March I set my course and recorded the times in my PLog. Bang on time I had Fenland Airfield on my left just where it should be, next was the A17 bridge over the river Welland and this was a little to one side. I descended to 2,000ft, I made my 5 mile inbound call and flew on, I could see Boston in the distance, I saw what I thought was the airfield and turned towards it, it turned out it was not the airfield and things started to go wrong! Where was I? As it says in the Hitchhiker’s Guide to the Galaxy DON’T PANIC! Looking at the map I was to the left of track and over the A17 so I corrected by turning east towards the wash and flying back towards Kirton and after a few minutes the drama was over and I could see the real Boston airfield! All my mental rehearsals paid off I made all the calls and flew the circuit as far as I know to plan and made a good landing too. I got out and went over to the club house where Mick, Julie, Pat and Sheila from Chatteris where with a group of people from Boston and they gave me a cheer and congratulated after saying welcome to Coningsby! A quick cup of tea and it was time to fly back, I got into the aeroplane a studied the map for a short while to ensure I knew what I was to do when I got to March on the way back. Now I had that in my head I got out and done the pre-flight checks. The departure was to plan and I set course soon crossing the bridge, at the halfway point I should have seen Fenland Airfield, I couldn’t, I had a sinking feeling inside. I could however see Wisbech ahead and not too far to my left so I must be left of my track, I added 15 degrees to my heading and by the time I got to March it was on my left just as it should be. I made my 5 Mile call but called 2 miles out, I quickly corrected this. I could hear Tom calling down wind and finals as he was flying circuits in AL, this was good news as it meant the parachute plane should be down! 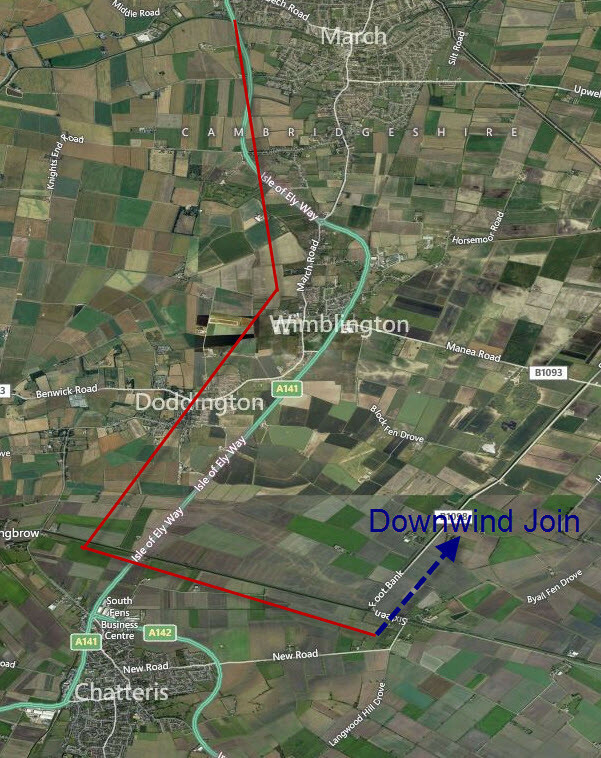 I Turned towards Doddington keeping the A141 well to my left so as to ensure I did not overfly the drop zone. 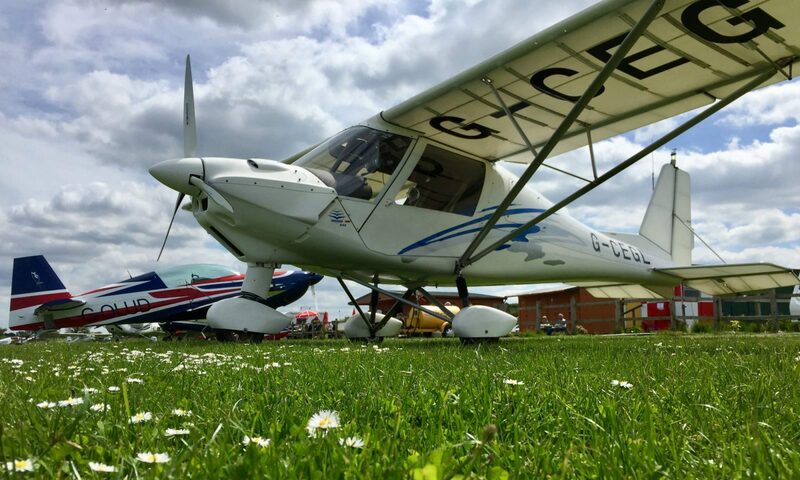 I could see Tom doing a touch and go as I few wide turning a little before Chatteris town and descending to circuit height to join downwind. The circuit went well as did my landing. Back in the clubhouse I was told Mike how it had gone and handed him the signed sheet, rating my airmanship and landing a “V good”. I explained how I had got off track and we discussed offsetting drift and plan to look at it some more next week. I felt euphoric, but totally drained, this was a lot more scarier than my first solo and for me, a much bigger achievement! Adrian well done, had my fingers crossed for you on Sunday and was watching the winds. Having got Boston out of the way, the second cross country is less scary. Congratulations Adrian! Although my first solo was euphoric and a major rush, it was over very quickly and was not completely expected so I did not get much time to stress beforehand. The first solo cross country, on the other hand, had all the planning and anticipation, and I have to agree that it was much scarier and felt like the most amazing achievement. I still think it was. I felt like a real pilot at last. Your description is excellent, and really brought it all back to me – so thanks for sharing. Onwards and upwards, and I’m sure the second cross country will be a doddle. Thank you Francois, I think you are spot on with you summary I.e. There was no time to thing before the solo! Next PostNext Fenland airfield gets Déjà vu!